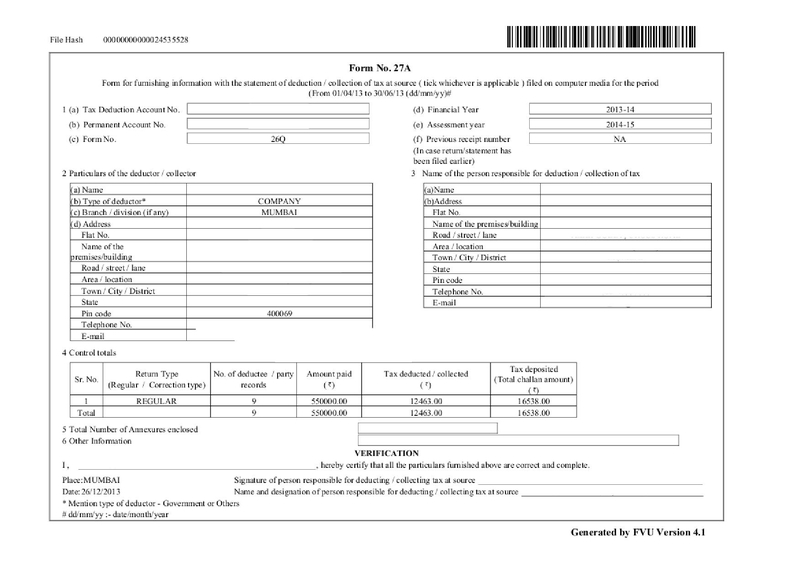 NSDL has notified changes in data structure and validations for filing eTDS statement for FY 2010-11. These changes are effective for the forthcoming second quarter statement filing due on Oct 15, 2010. The changes are primarily to give effect to Notification 41. (7) The person responsible for paying or crediting any sum to the person referred to in subsection (6) shall furnish, to the prescribed income-tax authority or the person authorised by it, such particulars, in such form and within such time as may be prescribed. In terms of sub section (7), now such transactions are to be reported in regular eTDS statement. Such transactions need not have valid PAN. Field for mobile number of responsible person has been added. Quarterly e-TDS statements (regular and correction) for FY 2010-11 should be validated with FVU version 3.0. If statement for Q1 FY 2010-11 is being filed late , does it need to be validated with FVU 3.0 ? The answer is Yes. it needs to be validated with FVU version 3.0.